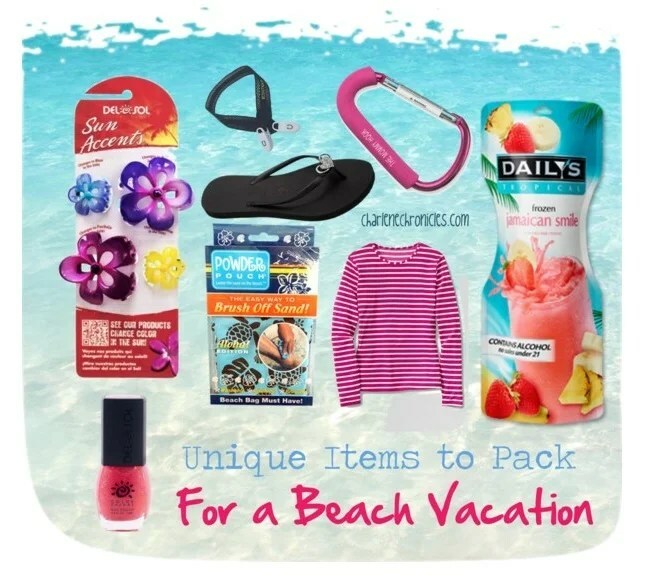 Cool items for a hot beach vacation! Having spent a week in a tropical resort (the Beaches Resort to be specific!) there were some great items that made their way into my beach bag and soon became my must have favorites for a beach vacation. Here are my top unique items for the beach. First is the Lands End Rash Guard Tee – it is great as a beach cover up, but also has posh appeal to act as a stylish and sun protective t-shirt when walking to get ice cream. Next up is some cool things from a company called Del Sol. They make color changing products like sunglasses, nail polish and hair accessories, to name a few. It was fun to clip my hair and my daughter’s hair in clear clips and watch them change color in the sun! If you want nail polish to give you different looks while away, then the Del Sol coloring changing polish is super cool for a hot beach vacay. Another discovery was the Powder Pouch. It is a free drawstring carrying cotton case that is washable and refillable, but pre-filled with a starter supply of talc that helps keep sand out of vehicles, upholstery and hotel rooms. (Plus, it makes changing baby diapers on beach a breeze.) Just pat the powder filled pouch a few times to release the powder, gently rub against the dry sandy areas of your skin, and the sand easily falls away leaving you feeling smooth and comfortable post-beach trip. Most of us Moms know about (affiliate link) The Mommy Hook for our strollers, but it was great on our beach vacation. We clipped our beach bags and sand pails to The Mommy Hook making the trek to the beach more organized. Dailys Cocktails make for a fun beach party. Keep the pouch frozen, and with a couple of minutes in the hot sand, it becomes a slushy alcoholic beverage perfect for an adult beach treat and the soft pouch passes the no glass policy at most beaches. If you like listening to music or a book on tape, while sitting in your beach chair, or want a early morning beach run (affiliate link) BudStraps were another great beach friendly find. The BudStraps are soft touch earbud retainers – like sunglasses straps for your earbuds. They let you clip your earbuds around your neck for a run, ride, walk or just hanging out by the ocean. They wash quickly under warm water, prevent cord tangles, and help protect you from losing your cords in the sand. Lastly, flip flops are a beach necessity but when on a resort, you need your beach flip flops to go from beach to barbecue. So having a pair of FlipOut Sandals means you can change the shoe jewelry to match your outfit or your outing. What unique item do you pack for a day at the beach or a beach vacation?